AMD did quite the shakeup of the mainstream graphics cards earlier this year with the release of the Polaris lineup of cards, comprising of the RX 460, RX 470 and finally RX 480. But we’ve been waiting for the company to jump into the bleeding edge arena, with silicone capable of pushing the frames at insane resolutions and graphical settings. In other words, we’ve been waiting for Vega, the companies often touted high end part which we’d presumed would compete with Nvidia’s current high end graphics cards, the GTX 1070, 1080 and of course the Titans. But that’s not happened, and AMD recently announced that we’ll not be seeing the Vega cards on store shelves until 2017… but new and rather interesting information has popped up to show there might be a reason for it. Early on in Vega’s announcement, we’d expected the silicone to be very similar to that found within Polaris – and that AMD were simply taking longer to produce Vega because the higher end parts contained more Compute Units and HBM2 (for the higher end parts). But since then, we’ve learned this isn’t the case, with AMD’s Chris Hook recently going on record and telling the world that there would indeed be some critical differences between both power consumption and efficiency of the design. So these latest reports hint to something interesting – we’ll be starting things off with Vega 11. Just like Polaris 11 (which is the RX 460 – the lower end part), Vega 11 will be the low end of the Vega line up, and will be supposedly replacing the current Polaris cards. Vega 11 will still be based on 14nm (just like Polaris) but will likely feature tweaks to improve the performance over the current RX 480 and its brothers. Unfortunately, specs of AMD’s Vega 11 haven’t been released, so we can only guess how it’ll stack up in clocks and shader count. Next up we have Vega 10 – the part most folks have been waiting to hear news on. There have been a plethora of leaks and official info on this GPU, but nothing too concrete. 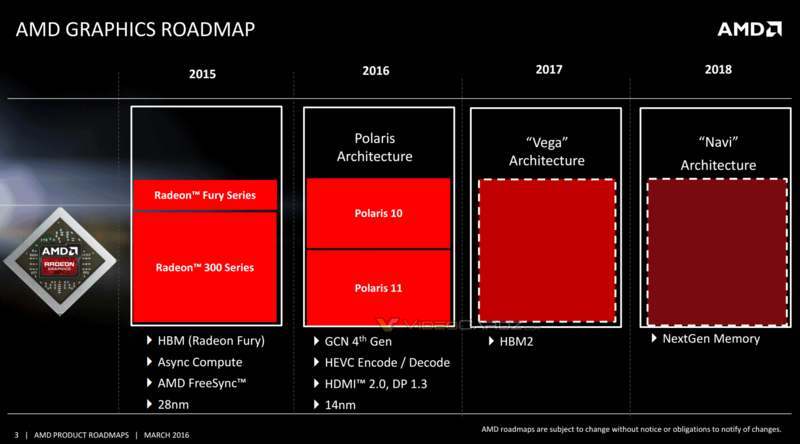 We do know according to AMD’s officially released roadmaps that Vega 10 will indeed feature HBM2, and a LinkedIn leak confirmed 64 CU (compute units). New reports tell us that it will indeed be still on 14nm FInFet, and sporting the GFX9 architecture (for sake of clarification, GFX8 is Polaris). 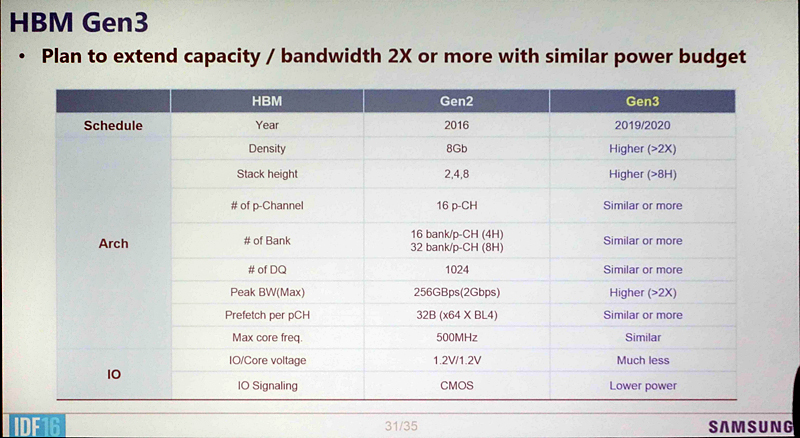 But that’s not all folks, Vega 10’s HBM2 will be up to 16GB and run at a rather impressive 512GB/s (you must that while that’s technically the same bandwidth as Fury X, there is a whole host of memory bandwidth compression added to later GCN architecture). Vega 10 will also kick things up to up to 24TFLOPS of computing power, with a dual Vega 10 part being released in the 2nd half of 2017, while the ‘single’ part will be released the first quarter. There will indeed be 64 Compute Units for the GPU, and power consumption will be 225W and 300W, for the single and dual cards respectively. We don’t have info on the number of shaders, ROPS, TMU’s or clock speeds. Hopefully clocks will be kicked up a little however, as Polaris certainly lost the clock war compared to that of Nvidia’s Pascal. AMD’s Vega 20 is… insane. According to these leaks we’ll see it using a similar architecture (GFX9 again) but the GPU will be created on a 7nm process. This (in theory) allows about 30 percent improvements in performance and double the density on the same silicone. Vega 10 has 16GB of HBM2 providing 512GB/s bandwidth, so it’s only fitting that Vega 20 doubles this to 32GB of HBM2 and 1TB/s of memory bandwidth. The power consumption for Vega 20 is also reduced, at just 150W and supports PCI-E 4.0, meaning we should have enough bandwidth and low enough power consumption to not require a nuclear reactor to power the damn thing. Again, Vega 20 will feature 64 Compute Units, though (just like Vega 10) we can expect there’ll be some tweaks in clocks and efficiency to get more out of the architecture. Finally, a small note about Navi – the cards have supposedly been put back a year later – meaning we’ll not see them launch until 2019. There’s precious little info about Navi aside that it will feature next generation memory (so possibly a mixture of HBM3 and GDDR6) and it will be ‘scalable’ – whatever that means. In theory, given the release date of Vega 10, AMD won’t be aiming to compete with Pascal but instead surpass it – but how it will fare against Nvidia’s Volta (which is the generation after Pascal) remains to be seen. As usual, stay tuned to RedGamingTech for more information and analysis. Thanks to VideoCardz.com for the info! Tagged with AMD, gpu, hardware, navi, polaris, vega 10, vega 11.